Teteria occupied this office only briefly. In late 1660 he went to Warsaw and spent more than a year at the royal court. Remembering that his first sojourn in Warsaw had helped him assume the influential office of general secretary, this time Teteria decided to vie for no less than the hetman’s mace. Royal service would be a new steppingstone toward this goal. To attain it, he planned to take advantage of the weak position of the young and indecisive Khmelnytsky and enlist the Polish government’s support. He managed to carry out his plan brilliantly. The future hetman succeeded in persuading King Jan Kazimierz that he was completely loyal to the Rzeczpospolita. In February 1662 Teteria set out for Ukraine on a royal mission aimed at assessing the political situation and determining the causes of Cossack unrest and the real meaning of the hetman’s relations with the Crimean khan. Further substantiation of Teteria’s influence on the young Khmelnytsky is the fact that, after arriving in Chyhyryn in late March, he managed to persuade the hetman to rescind his edict ousting Polish managers from royal and nobles’ estates in Ukraine. In all probability, Teteria believed that this edict would heighten tensions between Ukraine and Poland and would have extremely negative consequences for the Ukrainian state in the growing sociopolitical crisis. It may have been on Teteria’s advice that the hetman’s new edict stressed that the royal government’s demand would only be met if the king promised to leave the treaties of Hadiach and Slobodyshche in force. Teteria obviously believed that the Hadiach Articles, of which he was one of the creators, should be implemented as a true model of relations between Ukraine and Poland. Teteria, as an expert in Ukrainian affairs in the Polish government and the king’s representative at the hetman’s court, soon found himself at the hub of political life in Cossack Ukraine. His letters to Warsaw give a clear indication of the situation in the state. For instance, in a letter to the king, dated September 13, 1662, he pointed to Yuriy Khmelnytsky’s inability to control the situation in Ukraine: “Things are in disorder here because, although the hetman is a well-intentioned and diligent person, the army refuses to obey him.” The hetman himself also saw this. By October 17, 1662, H. Lysnytsky brought a letter to Warsaw from Khmelnytsky, requesting permission to offer his resignation. Thus, there are ample grounds to claim that by October 1662 the young hetman had in fact ceased to rule the state, perhaps under pressure from Teteria. Real power was grabbed by his experienced relative, who had also obtained the Polish king’s sanction. One of Teteria’s objectives was to try to curb the unruliness of the Crimean khans on Ukrainian lands. In his opinion, the Tatars were one of the most destabilizing factors that affected the morale of Ukrainian society, and Yury Khmelnytsky’s failure to protect the populace from the tyrannical horde was one of the reasons why he lost his authority. 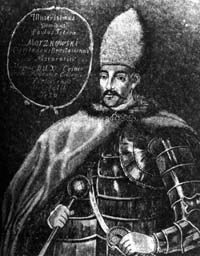 From September 1662 onwards, Teteria, in his capacity as the king’s representative, repeatedly sent letters to Warsaw, in which he described the anti-Ukrainian and anti-Polish actions of the Tatars, who “...have entire cities and districts at their mercy, [and are] wreaking havoc, looting and killing people.” Teteria even contemplated leading a military force to defend Polissia from the horde. In a letter of November 20, 1662, he wrote that the Tatars had decided to spend the winter in Ukraine, which they had never done before, and that he had no means to counter this. Also in the fall of 1662 the future hetman sought to win over influential representatives from among Cossack officers, the nobility and the clergy, resorting to promises as well as to downright bribery. It may be assumed, however, that what finally influenced the Cossacks’ attitude was the fact that as Bohdan Khmelnytsky’s godson and son-in-law, the future hetman belonged, in the words of Y. Dashkevych, to “the Khmelnytsky clan”. Apparently, Warsaw also got wind of Teteria’s attempts to lay the groundwork for his official election as hetman, but Teteria responded to this in quite a diplomatic manner. He announced that, although many colonels wished to see him, specifically, in the hetman’s seat, he was not trying to win the Cossacks’ disposition in advance because, in his view, this might result in the loss of the Cossacks’ trust. Still, in our opinion, the main factor that allowed Teteria to obtain the hetmanship and enlist the support of most Right Bank Cossacks was the idea of healing the rift in Ukraine. He was officially elected hetman on January 1-2, 1663, during the Chyhyryn council. In a letter dated December 26, 1662, the Polish delegate J. Swiderski noted that the main contenders for the hetmanship were Hryhoriy Hulianytsky, Mykhailo Khanenko, Petro Doroshenko, and Pavlo Teteria. The latter managed to take the greatest possible advantage of the pre-election situation and enlist the support of not only Poland but also the Crimea. For example, on the very eve of the election, he personally visited the Tatar sultan and suggested that he send a representative to the Cossack council, although earlier he had spoken out against the presence of Tatars in Ukraine. This is a convincing demonstration of Teteria’s ability to carry out a political maneuver and find a way to achieve his goal. Obviously, he had to promise something to the Crimean leadership, which allowed the latter to count on cooperation with the future Ukrainian hetman.